GEORGE V (1865-1936). King of England and Emperor of India; and his son, the future King EDWARD VIII (DUKE OF WINDSOR). 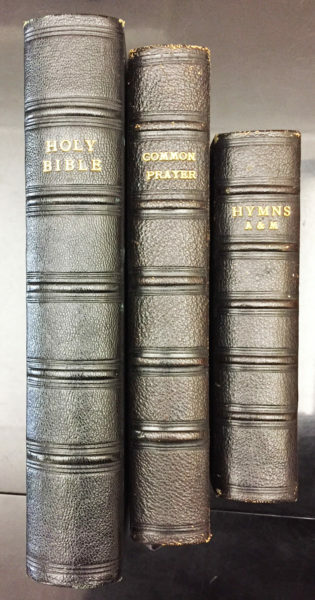 (1894-72). DS. (“George R.I.” and “Edward P.”). 2pp. Tall 4to. London, June 3, 1925. 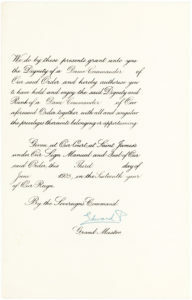 An appointment of Canadian opera soprano EMMA ALBANI-GYE (1847-1930) as Dame Commander of the Civil Division of the British Empire, with her autograph draft letter (unsigned) accepting the citation. George V ascended to the British throne with the May 1910 death of his father, Edward VII, the son and successor of Queen Victoria. George V’s 26-year reign witnessed challenges to Britain’s empire in Ireland and India and the upheaval of World War I, which altered the political landscape of Continental Europe and Britain. It was in 1917, due to anti-German sentiment, that George V changed his royal house’s name from Saxe-Coburg to Windsor. At the beginning of World War I, Edward, Prince of Wales, was commissioned to the Grenadier Guards, the official guard of the royal family but, to his great disappointment, he was not allowed to serve at the front. He did, however, distinguish himself in other campaigns abroad and “it was during the war that he first showed those qualities of charm, friendliness and sincerity that were to make him so popular,” (Royal Encyclopedia). After the war, he frequently represented his father, and became one of the most prominent celebrities of the day. But following his succession to the throne in 1936, public opinion turned against him because of his relationship with Wallis Warfield Simpson, a twice-divorced American, deemed unacceptable as a British queen. Edward’s determination to marry her led to the only voluntary abdication of a British monarch in history and made Edward’s reign the second shortest. Albani was born in Quebec but pursued her musical education in Paris and Italy. Her London debut took place in 1872 at Covent Garden in Bellini’s La sonnambula. In 1878 she married Ernest Gye continuing her career with [performances in Paris, the United States, Australia, and Canada. Her last public performance was in 1911. Her memoir, Forty Years of Song, includes accounts of her interaction with various members of royalty throughout her career. 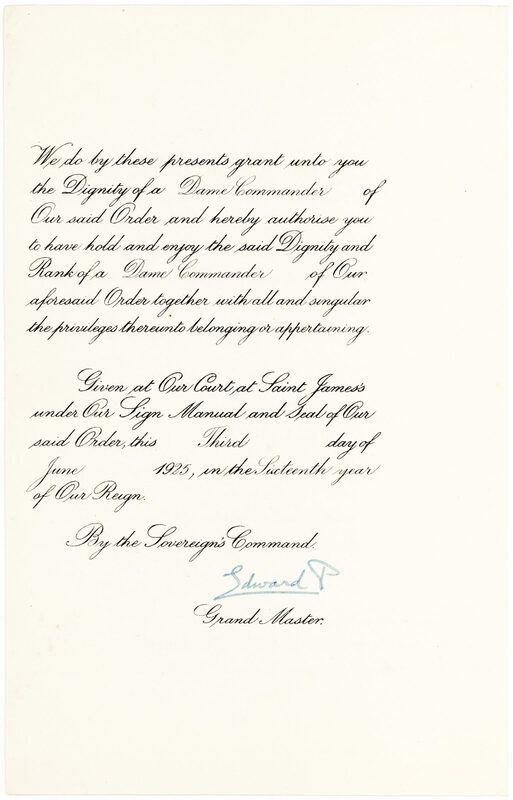 The chivalric order being bestowed on her in our document was established in 1917 by George V who, when he ascended the throne, committed himself to maintaining the splendor of his father’s reign. 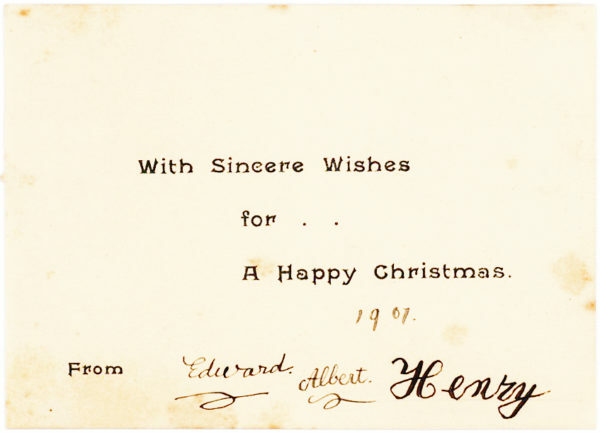 Boldly signed by George V on the recto and Edward on the verso. 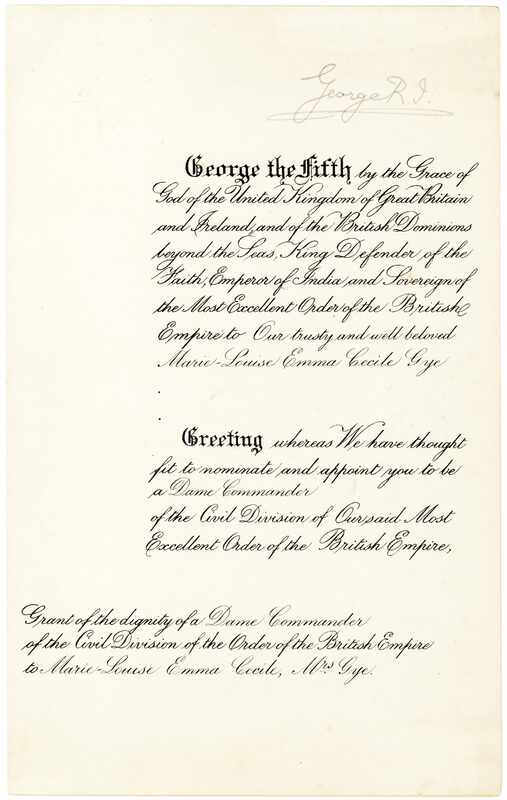 Documents signed by both these British monarchs are uncommon. 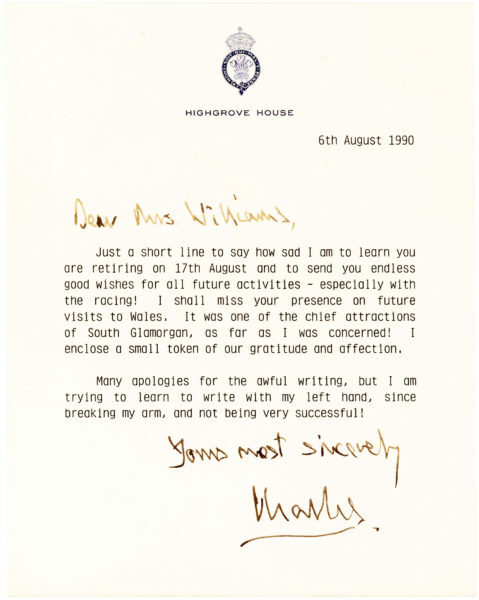 In addition to Albani’s draft reply there are several other pieces of related correspondence and ephemera.